Fr. Moacir Balen is the Provincial Superior of the Scalabrinian Province of St. Charles (Eastern Canada and the United States) and a Director of SIMN. Fr. Moacir devoted his first years as a priest serving migrants in Venezuela (1978-1985). 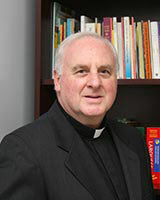 After one year of study in Rome, he moved to the United States and Canada to serve as a pastor at St. Joseph the Patron Church in Brooklyn, New York (1986-1995); St. Catherine of Siena Church in Mississauga, Ontario, Canada (1996-1999); St. Anthony Church in Somerville, Massachusetts (2000-2009); and Resurrection Parish in Winter Garden, Florida (2010-2014). On June 16, 2014, he was appointed Provincial Superior of the Province of St. Charles Borromeo (in New York) which covers the Eastern Coast of Canada and the United States, Haiti, Venezuela, Colombia and Ecuador. Fr. Moacir obtained a bachelor’s in Philosophy in São Paulo, Brazil and a bachelor’s in Theology in Toronto, Ontario, Canada.